If you were expecting some kind of thrilling denouement to the train trilogy, sadly, Network Rail, South West Trains and South Western Railway look like they’ve managed the whole thing rather well considering that to do the work hundreds of trains had to be cut and thousands of people had to change their plans. The three greatest movie trilogies of all time, according to Empire magazine, are (at 3) Back to the Future, (at 2) the original Star Wars films and (top of the pops) The Lord of the Rings. Once I have sold the film rights to this site then my current thread of posts will be competing for the top spot. If you’re not up-to-date here’s a handy recap montage: last month’s #SOLS post was about the Battle of Waterloo (the station not the Duke of Wellington battle) and, a few days later my ‘Will Commuters Even Notice‘ became a (not-quite) best seller on Medium. Both discussed the state of the trains, major engineering works and the small matter of the change of franchise on the railway lines into London Waterloo station. Assuming all is on-track (every pun intended) then Network Rail will give us our trains back on Tuesday morning. If you see this series as ‘Lord of the Rings’ then this is the thrilling conclusion to the story. If you think of this collection more like ‘Back to the Future’ then this is the weakest of the three with a mixed plot including some strange wild west space theme. If you’re thinking that this series more of a Star Wars classic then you are sadly deluded and I don’t know that you should read any further without seeking help. 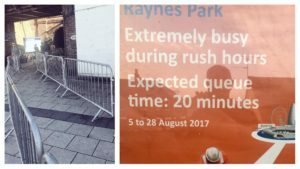 At my local station we even got a sneak preview of the queuing system we’d be expected to stand in for 20 minutes each morning. And then came Monday morning. The alarm went off 45 minutes earlier and, with some trepidation, I made my way to the station. There was some of those crowd control people I previously mentioned, lined-up to help the masses form an orderly queue. But there was a problem with all the planning: there were no crowds. For most of the time, I’ve had a seat on a partially empty train at a time I was warned I’d have to queue. Pulling into Clapham Junction station at around 7am would usually find a platform crowded with commuters trying to find a space: this week more people got off the train at Clapham than got on. It was emptier leaving the station than it was on approach. People have vanished. Response to the #WaterlooUpgrade on Twitter seems to have come in three main topics: those who are frustrated that the train timings have changed; those that campaigned for some money back because of the disruption (even after 14 months of warnings) and those who expressed shock that South West Trains were, suddenly, quite pleasant to ride at morning peak times. And in the middle of it all, with not a great deal of fanfare but a few little touches, Stagecoach bowed out and handled the franchise torch to South Western Railways. A couple of stickers and a logo, or two, added in places. The announcements were updated and my train was now a “South Western Railways service to London Waterloo” but it looked, and behaved, the same as always. When railways are franchised to private operators I believe it’s important to know who is actually running (and profiting from) the service. For the south west region, I think it’s going to take some time for the new company’s brand to land and, even longer, for people to know that this it’s a totally different company. Still, in the midst of all the disruption, a launch party would have been inappropriate. Sadly, the #SOLS timetable means I am posting this when there are still a 36 hours until the resumption of regular services and anything could happen. Over-runing engineering works would hardly be something new. And unfortunately, there will be limited improvements to the old timetabled services until December so it might look like this work was in vein. Plus, there’s the added pressure that, as part of the final stage of the London Bridge Thameslink works, South Eastern trains need to use some platforms at Waterloo from Tuesday. But, given what could have happened, there has been considerably less chaos than predicted and I am grateful for that. South West Trains, South Western Trains. You say tomato. As I noted in my piece about the upcoming disruption (starting in just a few hours) at Britain’s busiest station, London Waterloo, there are already plans to increase capacity by 30%. This increase is, in part, achieved by lengthening platforms to allow longer trains to run. This is in addition to the extension of most of the suburban platforms on the network and the extra carriages introduced in 2015/6 as well as the previously announced £210 million Desiro City trains that are due to enter service after the works are complete (part of the “biggest increase in capacity on this network for decades” [source]) adding 150 new carriages. Given the frequency of trains at peak hours, this must mean that the lines are pretty full. From my local station, there are 12 off-peak trains per hour (or 1 every 5 minutes) into Waterloo. Network Rail are squeezing extra capacity in but that means massive disruption to get us there. But what next? Well, despite all these longer platforms, extra trains and high customer satisfaction score, South West Trains lost their franchise. From August 20 2017, and for the next 7 years, First MTR South Western Trains Ltd (a joint venture between & Hong Kong’s MTR Corp) will run the service. South West Trains been the only private operator of the service since I moved to London. Prior to 4 Feb 1996 the service was public, part of British Rail’s Network South East operations. I imagine over the coming months somebody may repaint the train. I’m sure there will be stickers over the old logo and I imagine that there will lots of promotion for new a shiny new web site and some new social media feeds. But, really, will anybody actually notice? 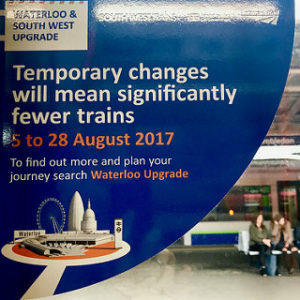 The first, “30% more peak seats per day at London Waterloo by December 2020” seems to be remarkably similar to service improvement already promised by South West Trains (and noted in my piece about Waterloo). “Simpler fares with pay as you go smart cards” seems to me to be a decent proposal but no details on how it’s better that SWT’s existing smart card offering. Of course there are promises of community engagement (“Increased engagement with local stakeholders” and “The biggest rail operator apprenticeship scheme in Britain”) which are all welcome but will have limited impact on the core railway issue: service provision. Top of the promise list is “The introduction of 750 new suburban coaches” which are promised by 2020 (so will be in service for about two-thirds of the franchise). But these are, ultimately, replacing the new Desiro City trains that are coming later this year (they haven’t even been introduced yet). In 2020 it seems that its a case of out with the new, in with the new. There are currently 1400 train carriages on the SWT network. It’s not clear from any of the promises (both from the incumbent and new provider) how many are really additional carriages rather than shiny new replacements. Yes, there are train refubushments (unless you’re on the Isle of Wight there are only promises of “proposals”) which include wifi and at-seat charging. These changes are welcome if you can get a seat to plug your phone into & the on-board wifi isn’t over capacity because the train is full. All this seems to me a change for limited gain. The new franchise will benefit from the improvement works at Waterloo and the introduction of the Desiro City trains but so would the existing supplier, who arguably, doesn’t see any benefit from all the work they have put in to get to this point. The new operator is adding new trains but taking away new trains and, even if they are better in some way, they won’t be here for a while. I don’t doubt that there will be improvements but, as a humble commuter on the busiest line in the country, it seems to we’re getting either things that have already been promised or cosmetic changes. I wonder, has it been worth all the expense of the franchise process? As I mentioned in my last piece on the topic, if passenger growth continues, where will real new capacity come from in a few years when the promised 30% is filled? So, what does the Mayor’s Transport Strategy propose as a solution to the overcrowding problems on the south west lines into London? 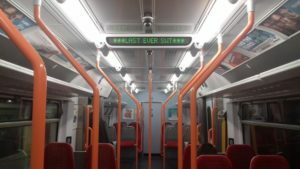 Author jonPosted on August 4, 2017 August 23, 2017 Categories TransportTags South West Trains, trains, transport, waterloo upgradeLeave a comment on Will Commuters Even Notice?